One of the worst parts of about having multiple payday loans is trying to remember to make multiple payments every single month, at the risk of a penalty fee if one is forgotten. By consolidating all of these loans into one, it can simplify the process and reduce the risk of missing payments and incurring more fees. Payday loans are notorious for having incredibly high interest rates. Rather than letting multiple loans accumulate interest, consolidating payday loans narrows these interest fees down to one loan. Reduce the overall interest rate and give yourself the opportunity to worry about fewer loans. One of the greatest benefits of consolidating payday loans is dramatically reducing the amount of stress in your life. Not only does consolidating multiple loans reduce stress, but you can also reduce the consuming stress that occurs when going through the complicated process of paying off payday loans by using the help of a trained professional. By going through the process with Real PDL Help, you be assured you never have to be alone through the intimidating procedure. Payday lenders may act like they are there to help, but in reality, they are just looking to get into your bank account. If you are unable to keep up with payments, predatory lenders will try to take the money directly from you, even if that means overdrawing from your bank account. Once you begin the loan consolidation process, you will be able to protect your bank account from these lenders. Many lenders will call you constantly until you are able to make payments. This can lead to significant fear and stress each time a phone rings. Once you begin the payday loan consolidation process, you can find relief from the dozens of daily calls. Because payday loans have extremely high interest rates, debt adds up quickly, even moreso if a payment is missed. With debt adding up, it can feel like you are trapped under a mountain of debt that is impossible to remove. Consolidating loans and making monthly payments can help you get out of debt faster. Debt can feel overwhelming, especially because many lenders call dozens of times a day until you the debt has been repaid. If you feel hopeless, you can find help in your time of need through payday loan consolidation. With have trained professionals to help you through every step of your personalized repayment plan, you will never have to be alone. Many people who take out payday loans have multiple loans. This can lead to a never-ending cycle of taking out more loans to make payments on the others. 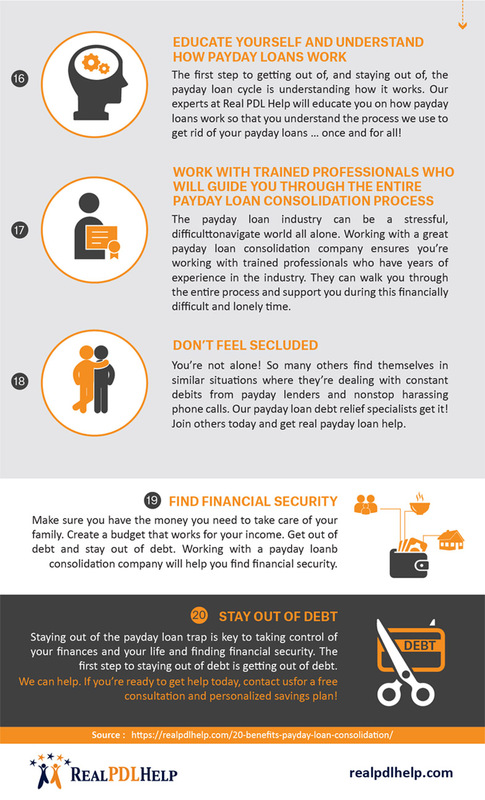 Going through the payday loan consolidation process can help you get out of the cycle and stay out of debt. A big reason that many people can’t get out of debt is that they haven’t figured out how to budget their money to make proper payments. Working with professionals to develop a budget that can help meet needs and help pay off debts is the easiest way to get back on track and out of debt. Once you get out of debt and keep the payday lenders away from your bank account, you can be in control of your own finances again. You can enjoy more freedom in financial choices and feel free to make any financial decisions you need to to ensure the financial well-being of your family. One of the biggest stresses of having multiple loans is trying to keep track of multiple loans and making multiple loan payments on time. Reduce the stress in your life and consolidate all of your loan payments into one easy monthly payment. The easier payments are, the faster you can pay them off. If you can’t meet all of your payments on time, you can be subject to late fees, which can make debt even harder to pay off. Once you have all of your loan payments consolidated into one easy monthly payment, you are much more likely to be able to make your payments on time and therefore avoid any late fees. Many payday loans don’t consider your income and what is even possible for you to pay each month. Working with the experts at Real PDL Help to make a payment plan that actually works with your income and monthly budget can ensure that you will actually be able to make payments each month instead of overdrafting your bank account or incurring high late fees. Many people with one payday loan, either already have, or end up with more payday loans. With so many bills to keep track of, it is almost impossible to avoid missing payments or forgetting other important bills. If all the loan payments are consolidated into one payment, it much easier to remember to make other important payments each month. One of the greatest benefits of getting out of debt is having complete financial security and freedom. Once you no longer have to make loan payments, you can put that part of your budget towards savings. These savings can be put towards a number of important items; a new home, an emergency fund, or your children’s education. One of the greatest benefits of working with trained professional through the payday loan consolidation process is that you will really get to know the ins-and-outs of payday loans. This can help you better understand how to get out of them now, and never fall into the trap of payday loans again. While anyone can make loan repayments, not everyone knows how to restructure loans to make them workable for you. Payday loan consolidations can help you find the best way for you personally to be able to pay off loans. This can save you time and money and help you get out of debt for good. High interest rates and nagging phone calls can feel even worse if you aren’t sure how it will ever be possible to pay off those loans. Working with the qualified professionals at Real PDL Help can help you feel a sense of hope as you work to pay off your loans with a professional at your side. Knowing that you don’t have to go through the stressful process of paying off your loans on your own can help you feel the motivation you need to pay off those loans little by little each month. With a large amount of debt, it is impossible to ever have total control of finances. Paying off loans and learning to budget money can help you take back control of your finances. One of the greatest sources of peace of mind is knowing that you are in total control of your finances and that you have the savings you need in case of an emergency. Once you get out of debt, you can finally enjoy financial freedom. By going through the process of payday loan consolidation, and learning just how tricky those payday lenders can be, you can learn more about predatory loans and learn about a budgeting process. This will help you from ever falling into debt again. Even though debt can sometimes feel overwhelming, it is possible to get out of it. Payday loan consolidation has many benefits that can not only help you get out of debt but also help you learn more about finances to enjoy permanent and total financial freedom.